Will Your Dog Enjoy The Snow As Much As You Do? Outside is where it’s at for your dog and not taking them out can be upsetting for them. 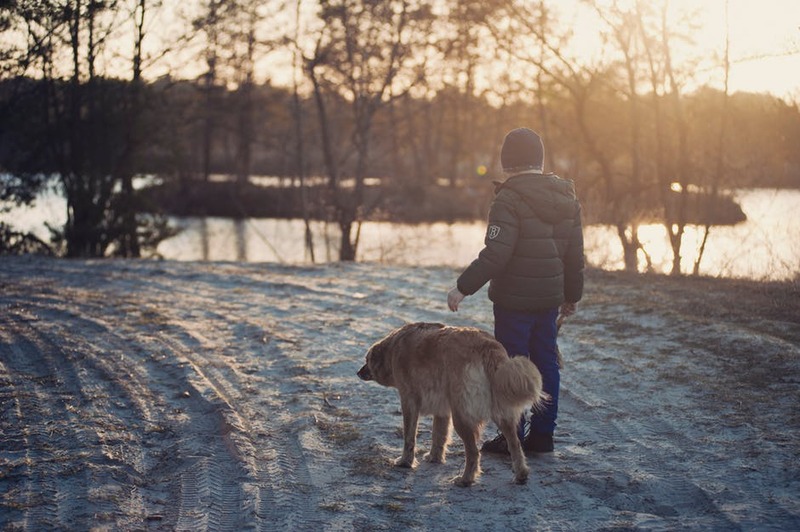 If you are staying in extremely chilly climates then you are sure to encounter inches of snow that may hinder your day to day activities including your play time with your pet. It is different for the Siberian husky as it is “made for” this weather, but if you are dealing with another breed, there could be some daunting complications you might have to undertake. It is quite true that snow can harm their eyes, paws and they are likely to lose their sense of scent. This is especially true if you have a dog as an ESA. Emotional support dogs work extra hard to keep their owners happy and positive, which is why you should always go above and beyond in looking after them. This information may seem a little overwhelming to deal with; however, not taking your dog outside altogether will adversely affect him. So, what should be done? If you are asking yourself whether to let your dog play in the snow, the answer is yes, but a few rules need to be implemented and adhered to for the sake of your fuzzy companion’s safety and well- being. 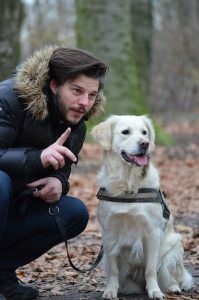 Here are a few tips and tricks that will help you spend quality time with your dog even in harsh weather. Not all species have the fur for harsh winters and snow. Huskies can endure harsher weather due to their thick fur coat and paws. However, for dogs that are not made for this climate, you need to keep their paws safe by investing in dog boots and balms. Make sure you frequently clean their paws and properly dry them. Snow has many unhealthy effects on human eyes and body due to its reflective nature, dogs can also get harmed by it if they spend more than thirty minutes in the snow. As soon as you spot your dog closing his eyes a lot, it is time that you take him inside as anymore exposure could lead to several health complications. Also, keep eye drops with you to clean his eyes when you take him inside. Ice can break easily and hurt your dog or they might slip and fall, which can lead to fractured bones. Avoid any ice patches while you are on a walk with your dog. 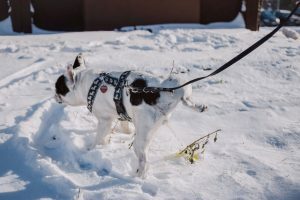 Even if your dog is trained to follow you around during snowy winters, make sure to take it out on a leash as he will become susceptible to losing his sense of smell and may get lost and hurt himself. Make sure that the leash is comfortable for your dog and he does not feel suffocated in it. Take a back [pack with you and do not think that walks in the snow will be same as regular walks. Take an emergency kit with your dogs eye drops with you when you go out. It is strongly recommended that you consult if your local vet. Do not pull your dog as it may drag its delicate feet. Make sure you spend as less time as possible in the snow without upsetting your dog. Trimming your dog’s nails may otherwise be a matter of hygiene, but during those snowy-walks, it definitely becomes a matter of safety. Nails can hinder the grip of your dog’s paw on the soft snow and may cause accidents. Trimmed nails provide better traction and your dog can control his steps even when a little ice comes his way. Make sure that the nails are trimmed all through winter and even when snow is melting to avoid falls and accidents. It is fine to let your dog out in the snow, but taking careful measures is extremely important to keep it safe. These tips are sure to get your dog through winter in one piece.